She was the original Rosa Parks. Dubbed the original Rosa Parks, Claudette Colvin was arrested in 1955 at the age of 15 for refusing to give up her seat to a white woman on a crowded segregated bus. The incident began when the bus she and her friends were on filled up and there was a white passenger standing in the aisle between them. The driver wanted all of them to move to the back and stand so that the white passenger could sit. “He wanted me to give up my seat for a white person and I would have done it for an elderly person but this was a young white woman. Three of the students had got up reluctantly and I remained sitting next to the window.” She informed the driver that she had paid her fare and that it was her constitutional right to remain right where she was. Of course, the driver didn’t see it that way. He continued driving and when he reached a juncture where a police squad car was waiting, he stopped. Two officers boarded the bus and asked Claudette why she refused to give up her seat. She was handcuffed, arrested, and forcibly removed from the bus all the while shouting that her constitutional right was being violated. She was initially charged with disturbing the peace, violating the segregation laws, and assault. There was no assault, of course. After she was released from prison, her family feared that their home would be attacked, so armed with a shotgun, her father kept a vigil just in case the Klu Klux Klan showed up, while members of the community were lookouts. Claudette was first person arrested for challenging Montgomery’s bus segregation policies and her story made a few local papers but nine months later Rosa Parks did the same thing and her story could worldwide coverage. On June 5, 1956, the United States District Court for the Middle District of Alabama issued a ruling declaring the state of Alabama and Montgomery’s laws mandating public bus segregation as unconstitutional. State and local officials appealed the case to the United States Supreme Court. The Supreme Court summarily affirmed the District Court decision on November 13, 1956. One month later, the Supreme Court declined to reconsider, and on December 20, 1956, the court ordered Montgomery and the state of Alabama to end bus segregation permanently. Following her life of activism, Claudette gave birth to a son who was light-skinned, leading many to believe that his father was White. She left New York in 1958 because finding and keeping work was difficult because of her participation in the Browder v Gayle case which overturned the bus segregation. After her actions on the bus, she was was branded a troublemaker by many in her community. She had to drop out of college and struggled in the local environment. She and her son, Raymond lived with her sister in New York. She got a job as a nurse’s aide in a nursing home in Manhattan and worked there for 35 years. In 2004, she retired. She had a second son who secured an education and became an accountant in Atlanta, where he married and had his own family. His older brother, Raymond died in 1993 in New York from a heart attack at the age of 37. Claudette never married. In 2017, the Montgomery Council passed a resolution for a proclamation honoring Colvin. March 2 was named Claudette Colvin day in Montgomery, Alabama. Mayor Todd Strange who presented the proclamation said of Colvin, “She was an early foot soldier in our civil rights, and we did not want this opportunity to go by without declaring March 2 as Claudette Colvin Day to thank her for her leadership in the modern day civil rights movement.” Claudette could not attend the proclamation due to health concerns. Notes to Women celebrates this unsung heroine who didn’t get the recognition she deserved for being instrumental in the fight against the Montgomery bus segregation by refusing to get up from her seat which she believed was a violation of her constitutional right. Rose could feel the townspeople watching her and Victor Ashdown as they left the local church. It was raining and Victor was holding the umbrella over her. The tongues had been wagging since they showed up for the Sunday morning service. No doubt they were wondering why Victor Ashdown was there with Rose instead of his grandmother, Lady Ashdown. Rose was the elder woman’s companion. 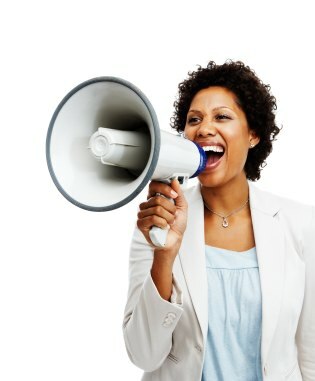 She had placed to an ad in the newspaper and received a reply. After providing references which were satisfactory, she was accepted to the post and a week later she was on her way to Langley Hall. It was the first time she had left the society of London and her friends to come to the countryside. She fell in love with Langley Hall the moment she saw it. The stunning, historic home surrounded by lush and idyllic countryside with its romantic interior of wood paneling and ornate chandeliers took her breath away. Her family cottage seemed dull compared to this splendid home. And the room she occupied was very charming. Lady Ashdown was very amiable and Rose soon developed a deep affection for her. Life at Langley Hall was pleasant. Then she met Victor whom she found to be very agreeable, engaging and irresistible. When she was not engaged by his grandmother, they spent time together in the garden where they had stimulating conversations. It was only a matter of time before they fell in love. Of course, it was no surprise to Lady Ashdown who raised no objections. Victor went to London to see her father who gave his consent. Rose had written several letters, telling her family about him. “Good morning, Miss Haversham,” the greeting brought her back to the present and she met the curious gaze of Mrs. Lambton. The older woman’s eyes were sharp with curiosity as she looked first at Rose and then at Victor. Rose feigned a smile. Busybody. She thought. “Good morning, Mrs. Lambton.” And she continued walking, giving the woman no opportunity to engage her in any further dialogue. “Horrible woman,” she muttered under her breath. Victor seemed amused rather than annoyed at the attention they were getting. “They will have plenty to talk about when you and I get married,” he said. Please pray for rain to fall in Fort McMurray, Alberta to put out the fire that has destroyed homes and devastated lives. There is the heartbreaking story of a firefighter who lost his teenage daughter in a crash. Our thoughts and prayers are with the family. Another story had a happy ending. A wedding dress was destroyed in the fire just days before the wedding but, thanks to the kindness of strangers, the bride has a new dress and is getting married tomorrow in Toronto. Pray for the people who lost their homes, had to be evacuated and the firefighters who are battling the fire. The response to the crisis in Fort McMurray has been incredible. Donations have been pouring in. Canadians have donated over $11 million to the Red Cross. Among the agencies working to help the displaced is ADRA (Adventist Development Relief Agency) Canada. ADRA Canada joined together with the Alberta Conference of Seventh-day Adventists to purchase a disaster response vehicle which has been filled with supplies to be delivered to those affected by this disaster. Local Alberta churches will provide volunteers and local families have opened their homes to the displaced. ADRA Canada has also partnered with GlobalMedic to send hygiene kits containing toothbrushes, toothpaste, soap and a towel to 2,000 people. If you are interested in helping ADRA in their work in Fort McMurray, please make a donation to their Emergency Relief fund at http://www.adra.ca/donate/. Naomi was a Christian. She grew up praying to Jesus as a Friend and reading the Bible so that she could get to know Him better. So great was her love for God that it was natural to believe that when she had children, she would pass on her faith to them. However, things didn’t turn out quite as she expected. Naomi’s parents arranged her marriage and although the wedding was held in the church and followed all the Christian traditions, her husband was of a different religion. Can you imagine being in Naomi’s shoes? You were raised to love the Lord. You look forward to going to church and worshipping Him in His sanctuary with others who share your faith. Then, one day, you are forced to stop going to church because your husband won’t allow you. And to make matters worse…your husband is an alcoholic. Shortly after the wedding, Tarak’s alcoholism reared its ugly head. He had a steady job as a truck cleaner but spent the money he earned on drinks or cigarettes. As a result it was a struggle just to have the bare necessities. The struggle only increased when they had Oppilmani and Sadhya, born two years apart. Now Naomi had two growing children to feed not to mention providing them with clothing and education. Overwhelmed, she was compelled to reflect on her life before she got married. With a penitent heart she began to pray. She didn’t tell Tarak that she repented of her neglect of God or that she was praying for the family’s restoration. She didn’t tell him that she was praying for him–that he would stop drinking. Can you imagine how hard it must have been for Naomi to keep these things to herself? How she must have longed to tell her family about Jesus and how only He could help them. 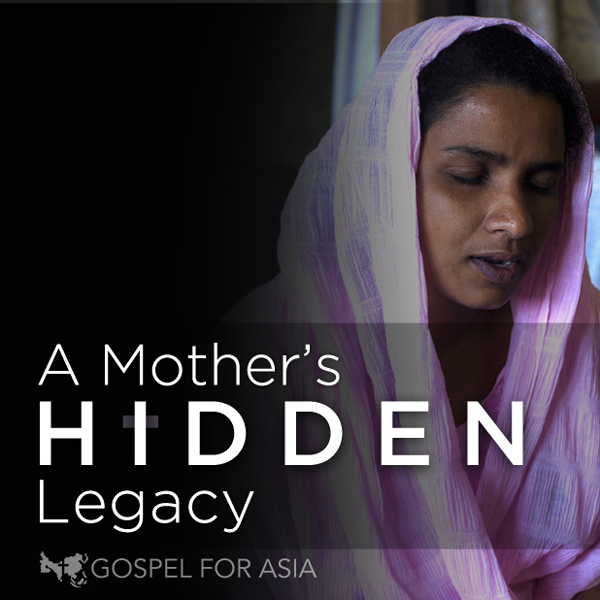 Then, hope came in the form of Gospel for Asia Pastor Zaafir when he came to their village. God heard her prayers and He sent help. Naomi began to speak to Pastor Zaafir frequently and began attending church again. As she grew in the Lord, Pastor Zaafir helped her to enroll Oppilmani and Sadhya in the local Bridge of Hope center. This proved to be a blessing for the children. They excelled in their studies and learned about Jesus. How it must have brought joy to their mother who had dreamed of telling them about the Friend she had since she was a child. Tarak’s years of drinking and smoking finally began to take a toll on his health. 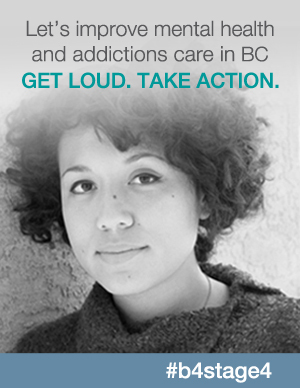 What began as asthma quickly turned into something very serious and unmanageable. How terrifying it must have been for his family when he began vomiting blood. He couldn’t eat anything. However, the waves of nausea and the vomiting didn’t stop Tarak from continuing to drink alcohol. Within a few days, he was taken to the hospital where doctors determined that he had a serious lung infection. If he didn’t have an operation he would die. What was the family to do? For years Tarak had spent his income on alcohol. There wasn’t enough money for the operation. Naomi and the children, went home, bracing themselves for a future without her husband. The children continued to attend the Bridge of Hope center but it didn’t take long for the staff to notice that something was wrong. When they inquired, Oppilmani told them about his father’s condition and that the family couldn’t pay for the surgery. The staff offered words of encouragement and hope. They assured the boy that Jesus could solve his problems and then they decided to visit the family. The coordinator of the centre went with two social workers and GFA’s pastor Bahurai to the family’s home where they saw an alarmingly thin Tarak who looked much older than his age of 35 years. The group shared God’s Word and encouraged the family to ask for His mercy. The Lord spoke to Tarak’s heart and the father confessed his wrongdoings to God. From that moment on, there was a transformation. Naomi no longer faced opposition from her husband and she was free to regularly attend prayer meetings. She, the pastor and other believers prayed for Tarak’s healing. He began to recover slowly and he opened his heart to the God who was healing him. Tarak no longer insisted that his family worship his god or protest his wife’s church going. Instead he brought the children to church. It took a life-threatening illness for Tarak to know the true God. God had answered the prayers of a mother who had known Him all of her life. She had turned back to Him after she was forced to neglect Him–knowing that He was her only Source of comfort, hope and deliverance. God heard the prayers of a wife who wanted her husband to stop drinking. He heard the prayers of a mother who wanted her children to worship the true God and go to school. He heard the prayers of a woman who wanted to free her family from their struggles. You can help to do amazing things for other families like Naomi’s by sponsoring Bridge of Hope children. Your sponsorship will open the door for children to share Christ’s love with their families. If you are interested in learning more about Bridge of Hope visit this link. Imagine what it would be like if your son or daughter was forced into child labor. On the Voices of America (VOA) site I saw a photo of five year old Pakisthani girl named Naginah Sadiq. She worked in a brick factory. In the photo she was resting on a bed next to her 8 month old sister Shahzadi on World Day Against Child Labor on the outskirts of Islamabad, Pakistan on June 12, 2012. She was wearing dirty clothes and was barefeet. Her hands and feet were dirty. She looked so tiny. How could she work in a brick factory? This photo was taken three years ago. Is she still working there? Will her baby sister be forced to work once she turns five? Millions of children are forced into child labor in order to support their families. I’m sure that Naginah would rather be like other children who get to play, have no responsibilities and go to school–things that our own children take for granted. Growing up, I didn’t have to worry about anything. There was always food on the table, clothes for me to wear and I went to school. I didn’t do any housework. I played with my friends or spent most of my time reading and writing. Life was good for me. I had a decent childhood. This is the kind of childhood that children like Kalavati could only dream of. Can you imagine how eleven year old Kalavati felt when she saw other children playing without a care in the world while she worked alongside her mother? She had been working since she was eight years old. At eight I was probably still playing with dolls. Kalavati had to work in order to support her family. She had no choice. Her father lost his job because someone had performed witchcraft on him, causing him to be mentally disturbed. He stopped showing up for work and then he disappeared. Days, weeks, months and a year passed but there was still no sign of him. Then one day, while walking through the village, Kalavati’s mother, Bhama saw a crazed looking man, sitting under a tree. He was naked and alone. He had a long beard and at first she didn’t recognize him. Then she realized that it was Deval, her husband. She took him home where he was welcomed by the family who were relieved and overjoyed to see him. The joy didn’t last, though. Deval was not in his right mind. They took him to the hospital to be treated but that didn’t work. He was violent and no one could control him. His story reminded me of the one about the man who was living among the tombs in the country of the Gadarenes because he had many demons. He was violent and no one went near him. Deval began to throw stones at the villagers. He was not the same because of the curse someone put on him. Tired of dealing with Deval’s violent behavior, the villagers drove the family out of their home. Life went from bad to worst for Kalavati. Now she had no home or support from the neighbors. The family went to the big city where Bhama hoped to find work. For days they lived and begged on the streets until Bhama finally found work as a maid in a farmhouse. Unfortunately, this job was not enough. It didn’t provide the family with the relief they needed. Bhama worked day and night but it was not enough to provide two meals a day. Kalavati helped her mother with the laundry and cleaning of the utensils in the house but all the while she wished she could be like the owner’s children. She saw them studying and wished she could do the same. At that moment education seemed far out of her reach. It was merely a dream that would never come true. What touched me as I read this story was when Bhama became so discouraged because her husband was not getting well in spite of the treatment he was getting with the money she had borrowed from her employer that she was convinced that the only way to save her family from the ever-growing burdens was to poison them and herself. It was at that moment when God intervened. It was around this time that the Bridge of Hope staff members visited the family. They listened as Bhama told them that she didn’t believe in God and revealed her plans to commit suicide. They told her about Jesus and prayed with the family. Bhama had a change of heart about God after her encounter with the believers and when she saw some improvement in Deval. She knew that this miracle could only have been the result of the believers’ prayers. This prompted her to visit the Bridge of Hope center the next day and ask if they would enroll Kalavati. The dream that had seemed impossible for Kalavati became a reality! She attended the center the following week. The staff members continued to ask God to heal Deval and for Bhama to find stable work so that she could provide for her family. God answered their prayers. Bhama found a stable gardening job at the local hospital. Kalavati helps her sometimes but not because she has to. Kalavati can be like other children. She plays and draw pictures. And she is getting an education. She has something far better than what the children of her mother’s ex-employer had–she has Jesus in her life. 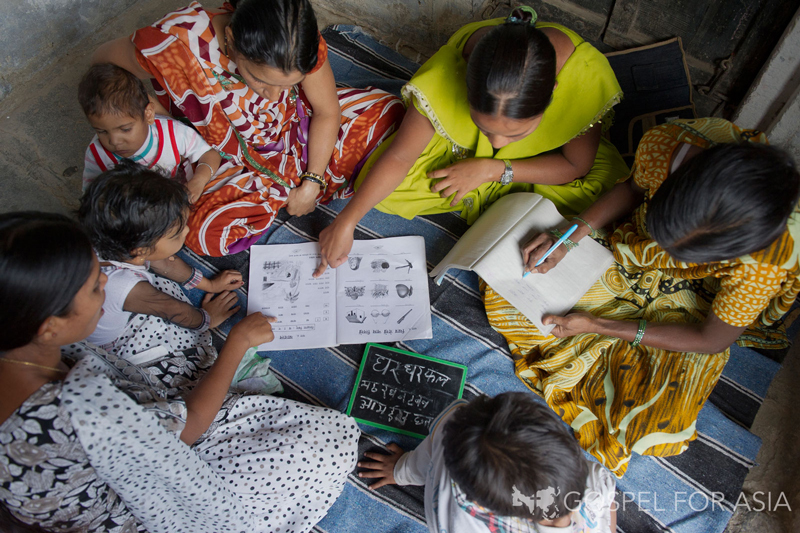 Thanks to the Gospel for Asia workers, Kalavati and her family learned about Jesus. She is thriving at the Bridge of Hope center. She has reason now to dance and play with her classmates. The love of Jesus has transformed her world. There is hope now when there was so much despair. Her father is improving a little at a time. He is no longer aggressive and violent toward others. He eats meals with his wife and daughter and attends church with them. Together they worship the One who saved their lives. Just think, there was a time when Bhama thought there was no hope. She saw no way out of her despair. She saw no end to the family’s struggles. But God does not give us more than we can handle. He sees what we are going through and He intervenes. Thanks to the Gospel for Asia Bridge of Hope ministry, Bhama came to know the God she had not believed in. He had revealed Himself through the changes He had brought into her life. God revealed Himself in a very profound way and helped Bhama to do what she could not do in her own strength. Pray that God will intervene in the lives of other children who are trapped in child labor or families who are forced to beg in order to survive. You can make a difference. You can sponsor Gospel for Asia’s Bridge of Hope ministry so that they are able to reach out to families like Kalavati’s and share with them the hope that they can find only in Jesus. Or you can sponsor a child like Kalavati and change a family. With God’s help, you can help Asian boys and girls to be like other children who are free to play and draw and do the things that children do. You can help to protect them from those who would rob them of their childhood and innocence, deny them a bright future and crush their hopes and dreams. Tuesday, September 8, 2015 was an important day for lots of parents and their children. It was an important day for my family. It was my son’s first day back to school. This year he will be in grade 2 . It was wonderful seeing parents and their kids filing into the school. The halls were crowded and noisy as we squeezed our way to the gym where the children were to line up before heading to the auditorium for the greeting and morning prayer. As I looked at the children in their uniforms, I thought of how what a blessing it is to be able to go to school. September 8 was an important day for another reason. It was International Literacy Day, a day first proclaimed as such on November 17, 1965 by UNESCO. It was first celebrated in 1966 and its objective has always been to highlight the importance of literacy to individuals, communities and societies. The theme for this year was Literacy and Sustainable Societies and the Day marked the 50th anniversary of the World Congress of Ministers of Education on the Eradication of Illiteracy. It is a day when the world is reminded of how important learning is. International Literacy Day gives children and communities a chance to rediscover the joys of reading while raising awareness for those without access to education. Can you imagine being a mother and unable to read your child’s school report or help him with his homework because you can’t read or write? What if you couldn’t read the Bible or a bedtime story to your child or a Mother’s Day or birthday card? Sadly, there are women in South Asia who can’t read or write. Can you believe that over 30% of Asian women are illiterate? In fact, more than one out of every three women in Asia are illiterate! 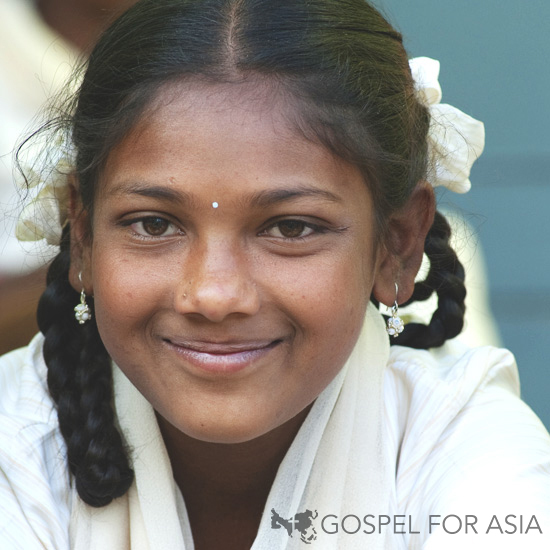 There is hope, thanks to Gospel for Asia’s Literacy Program. Through literacy classes held by GFA supported local Women’s Fellowships, women are learning how to read, write, do basic math, some of life’s most basic lessons, and, most importantly, they are learning how to read and study God’s Word on their own. What a joy it must be to be able to read about a loving God and a Savior who gave His life for them. And better yet, they can read to their children. So women volunteered to teach literacy classes to other women. The program expanded into several states and two countries, so a standardized curriculum was developed. In this day and age, it is hard to believe that there are so many people who still cannot read or write. 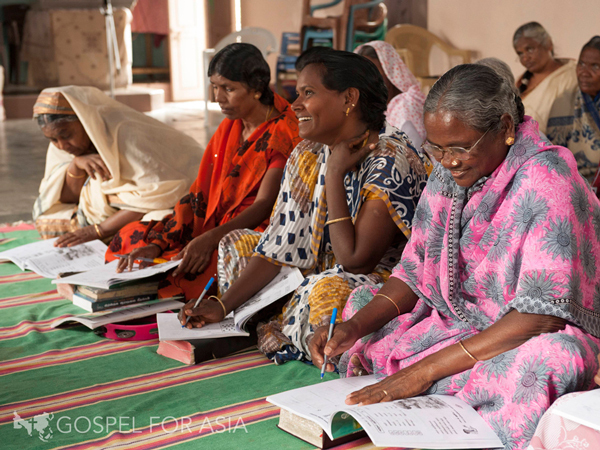 Last year, Gospel for Asia supported the work of missionaries who saw International Literacy Day as an opportunity to raise awareness of the value of women’s literacy and to share the Gospel. Do you want to bring hope to women by helping to make it possible for them to read and study God’s Word? Find out how you can do so here. Reading and writing are basic necessities of life that everyone should have. Women who learn how to read, write and do basic Math will be able to provide for their families. You will be helping a woman to keep her children safe because she can read the warning labels or from being cheated at the marketplace because she knows basic Math. Think of how different your life would be if you couldn’t read your Bible, recipes, emails or letters. Then think of the freedom you enjoy from being literate and how you can help to liberate these women too.